The 2016 AGM (Annual General Meeting) of Shropshire Hills Tourism Ltd was held at The Discovery Centre, Craven Arms on Tuesday 10th May at 11am. The draft minutes are here Minutes Welcome to new Board members Caroline Magnus and Louise Welsby. Following the meeting there were a brief series of informative talks designed to enhance tourism businesses. Nigel McDonald spoke on the use of Using GeoCaching as a way to engage visitors. This gives them a chance to explore the great outdoors we have on offer with a treasure hunt included. This is becoming more cost-effective with installation of GPS on modern phones plus lower cost GPS systems. Nigel also talked about the benefits of the Buy-Local scheme for increasing sustainability. Paul Davis talked about LeveragingGoogle. How understanding where your traffic was generated can help focus your business advertising efforts. This means businesses can get best value for money. This was the official South Shropshire launch of Marie Kreft’s new book “Slow travel in Shropshire“. Marie gave a talk on Embracing Slow in Shropshire . This covered travel and encouraging people to visit all our wonderful secret places. Marie’s book has lots of great information and is a recommended buy for all accommodation providers! Clicking on the links gives the Powerpoint presentations from the 2016 AGM, but obviously not the detailed verbal descriptions! In addition the Photographic Competition was launched at the 2016 AGM. 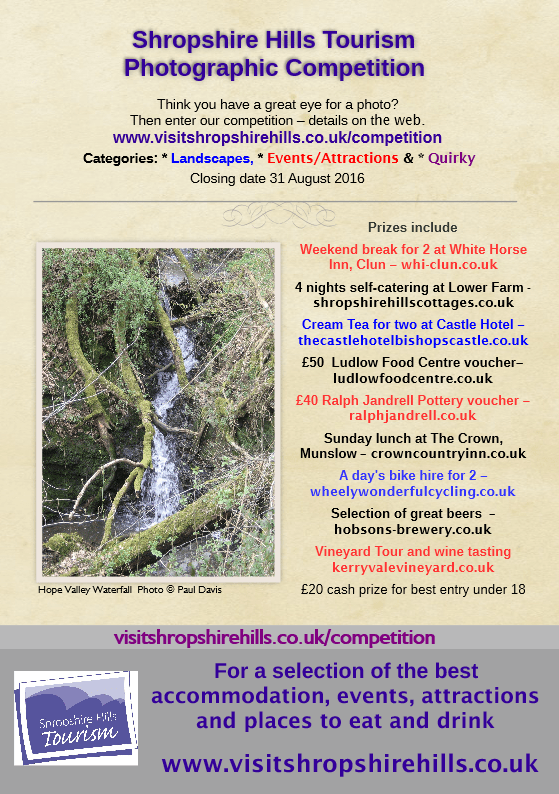 Flyers have been printed to promote the competition – the prizes now amount to £1,000 in value.